Neck pain is experienced by 70% of the population over a lifetime and 20% of the population will experience neck pain at any point in time. Neck pain is generally the result of either an injury or prolonged poor postures. Our head is heavy and balances on the narrow ridge created by the vertebrae. The cervical vertebrae consists of seven bones stabilised by joints and ligaments and moved by muscles. 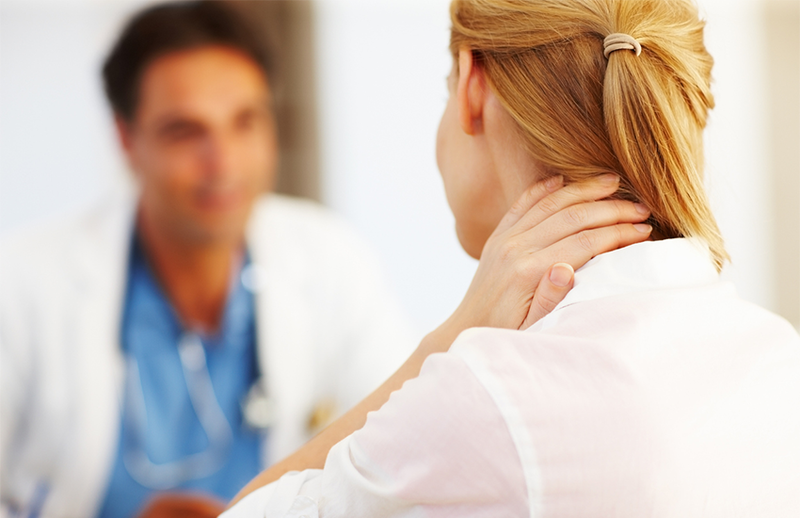 The most common occurrences where a neck injury could occur would be in a motor vehicle accident, sporting incident or occupational accidents. As for back pain, bad posture is also a large cause of neck pain. The posture we have adapted through countless hours sitting at desks, in front of computers and TV or driving are large contributors to neck pain. Slouching of the shoulders, hanging the head forward and rounding of the back can increase neck pain and can bring on symptoms of neck pain. These symptoms can include sharp pain, dull muscular aches, reduced range of motion and headaches. With all the hours we are spending in front of screens, in cars or looking down at phones it is important to always keep your posture in check. “Think tall” – Relax shoulders, keep chin tucked in, head level and chest proud. Sleeping on your stomach leaves little options for a comfortable neck position. The pillow supporting your head for the hours spent sleeping is also very important in preventing neck pain. If you are waking with neck pain or headaches you may need to update or change the pillow you are sleeping on. When we are stressed our body’s reaction is to tense, take note when you are feeling stressed and make the conscious effort to relax the neck and shoulders and readjust your posture. Make sure your workstation is set up correctly with screens at eye level. When we are looking at a phone or IPad more often than not we hold them in our laps tilting our head down to look at them. In this day and age, we are always looking at our phones so ensure that they are in a suitable position at eye level whenever possible. If you feel your workstation could be contributing to your neck pain, speak with our Occupational Health Physiotherapist who can advise and assess you and your workstation. Muscular Imbalance– Muscular imbalance is very common for many people. Your physiotherapist can assess your posture, strength and mobility and can prescribe a course of action moving forward to alleviate pain. If you are suffering from neck pain the best thing to do is see a Physiotherapist and have your pain assessed and relieved.